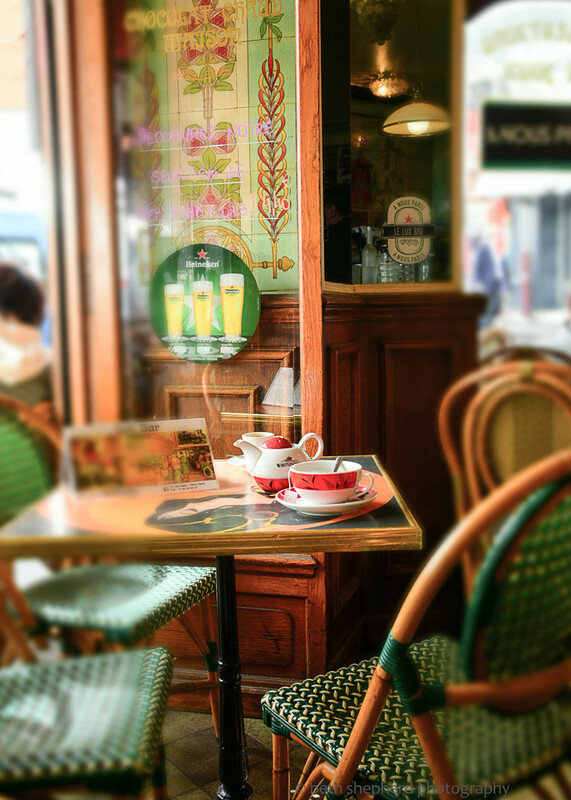 Parisian cafés are one of my favorite things. What’s not to like? 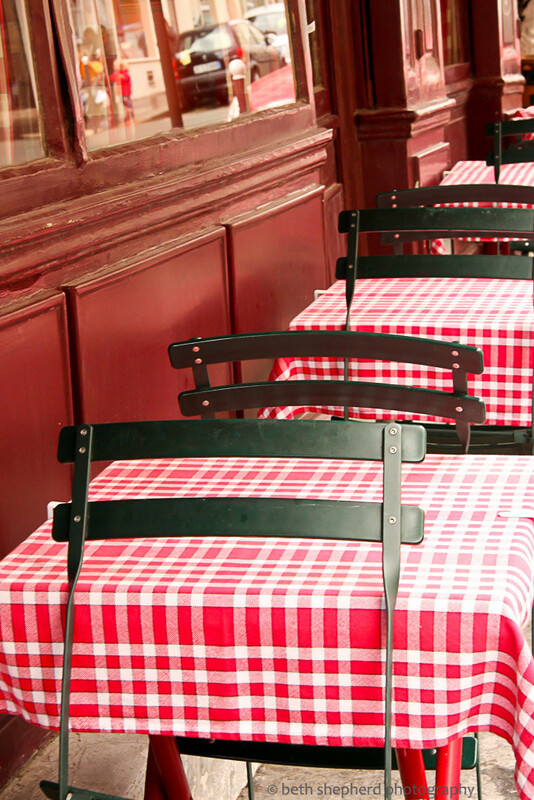 Cute tables, wicker chairs, the ambiance of café culture and, of course, the food. It all has that je ne sais quois that feels so French. 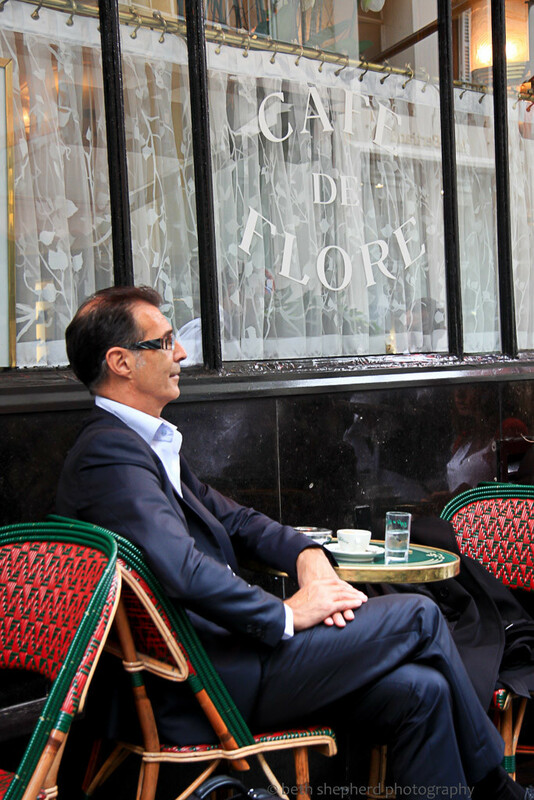 When I’ve had the good fortune to visit Paris, sitting at an outdoor café is the first thing I want to do. There are a few cafés I am especially fond of in Montmartre. This is the neighborhood where I’ve often stayed. I still remember the breakfast my husband and I had at Chez Clint on one or our trips. 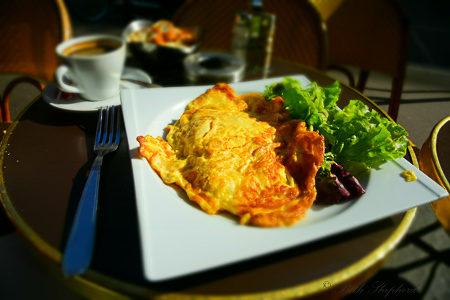 Divine espresso and an omelet filled to the brim with French cheese. Oooh la la! 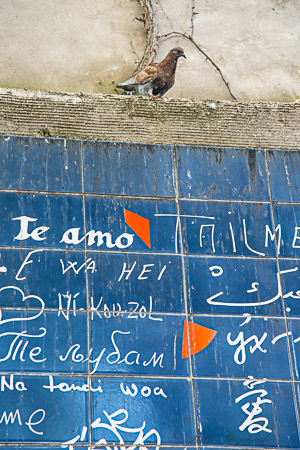 Paris, je t’aime. 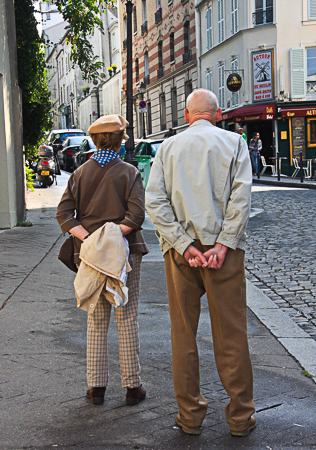 I love sitting at your sidewalk cafes, sipping espresso, dining on French omelets and Salad Nicoise. 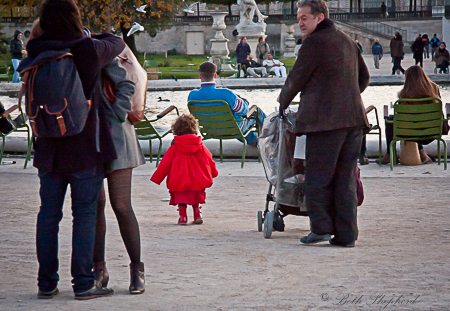 I love strolling along the Seine at sunset and amid your beautiful gardens on a sunny afternoon, the Tuileries, Jardin du Luxembourg. 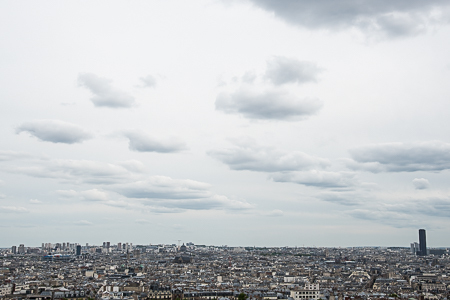 I love climbing the hills of Montmartre to look out over the spectacular city you are. I love your grand boulevards and tiny side streets, your elegant architecture and stately statuary. 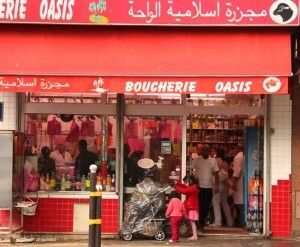 I will never tire of your vibrant markets, trendy shops, the lilt of the French language, your je ne sais quois. 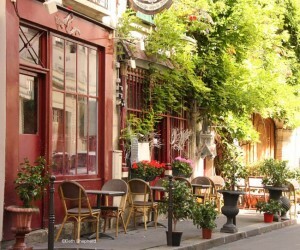 I have been so fortunate to have had opportunities to get to know Paris. 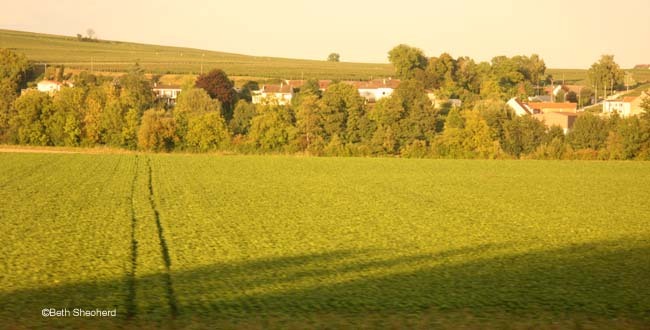 During the mid 1980s, when I was an international student studying in Amsterdam, I made several journeys by train to Paris. 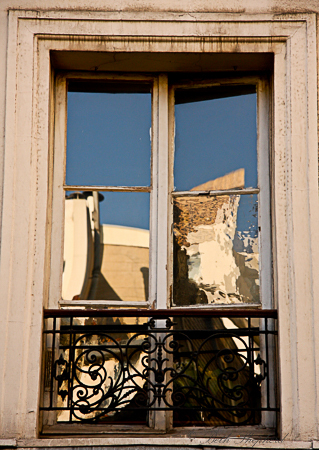 On various trips to Armenia, Paris was our preferred stopover. We’d spend several days on the front end of each trip–joie de vivre–before continuing on to Yerevan and several days again on the tail end before heading home to Seattle. 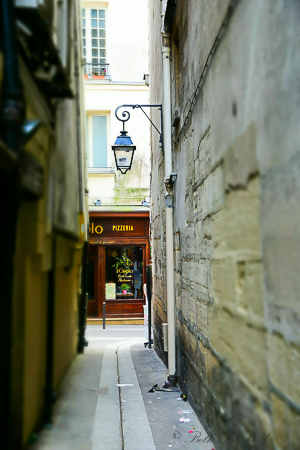 And this past May I visited Paris solo–seven glorious days all to myself soaking in everything Paris has to offer, exploring new neighborhoods and revisiting old favorites. Four months had passed since the Charlie Hebdo shootings. I’ll be honest, I thought about it as my flight took off and headed overseas, and I thought about it as I wove my way through the city. At first, I walked and walked for miles, reluctant to ride the Metro. I kept my distance from large crowds. I took measures–so I thought–to be safe. But that didn’t last for very long, and I’m grateful I didn’t let my fear get the best of me, the best of my visit to one of the most beautiful cities in the world. 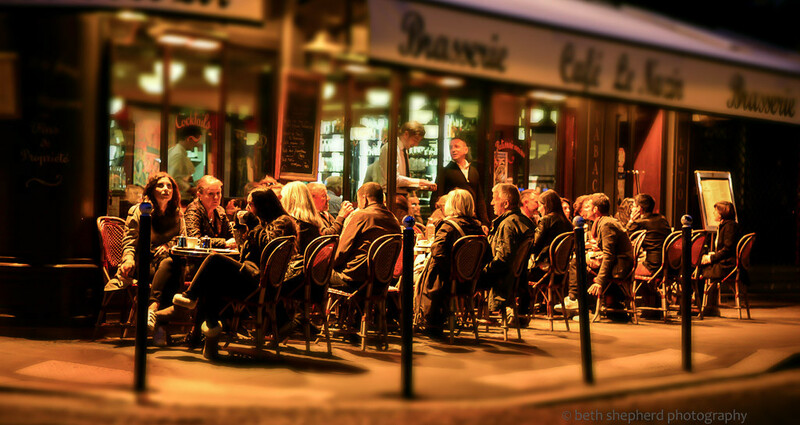 As horrific as the attacks in Paris and Beirut last week are, I am reminded that the only way I can ensure my safety is to avoid getting on a plane, never sit at a sidewalk cafe, maybe never leave my house. And while I can’t say I live without fear, I know I don’t want to let fear be my guide. Because if I do, I will never be able to enjoy the adventures one experiences only if you leave the protection of your nest. I love you Paris. One day I will see you again. 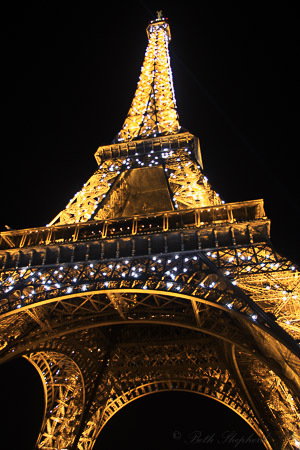 For me you will always be the City of Light. 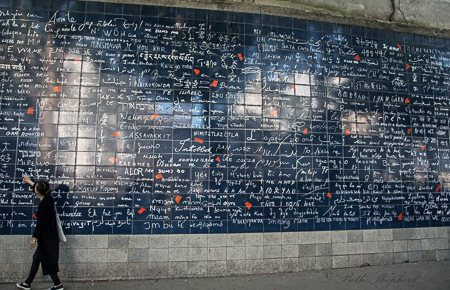 The “I love you” wall stands at the center of a garden just behind the Abesses Metro Station in Montmartre, Paris. 612 tiles of enameled lava cover a surface area of 40 square meters. The phrase “I love you” is written more than a thousand times in over 300 different languages. 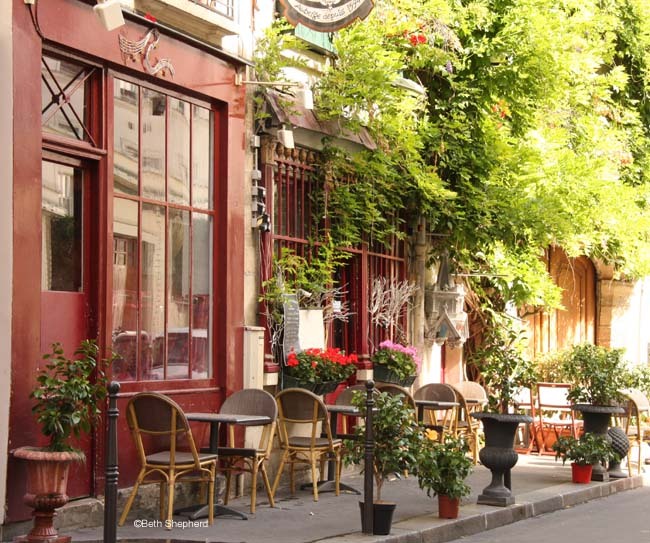 The garden itself–in Square Jehan Rictus–is worth stopping by for a stroll, lovely and serene, the perfect place to step away if you are in Montmarte and have battled the crowds at Sacre Coeur. 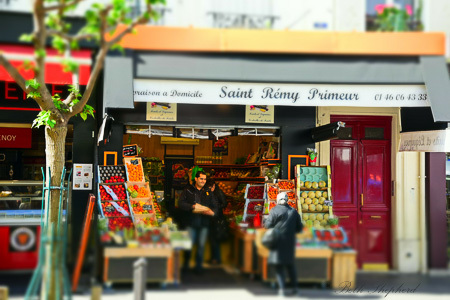 Square Jehan Rictus originally opened in 1936 on the site of the old town hall where the Commune of Montmartre stood from 1837 to 1882. In 1994, the square was reconstructed and planted with a large variety of shrubs and trees, laid out around a central fountain. 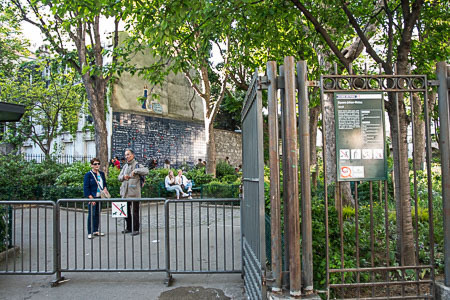 The square was named after Gabriel Randon de Saint-Amand (1867-1933), alias Jehan Rictus, a Montmartre artist who gained fame with his poems and songs written in the popular French of the time. He was a friend of painter Paul Gaugin and many other famous artists. 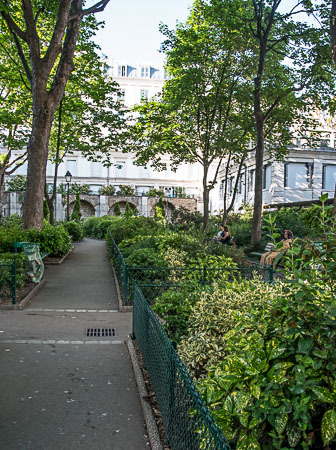 A little oasis of greenery near the busy rue des Abbesses, it’s a wonderful spot to stop and sit and enjoy the quieter side of Paris. 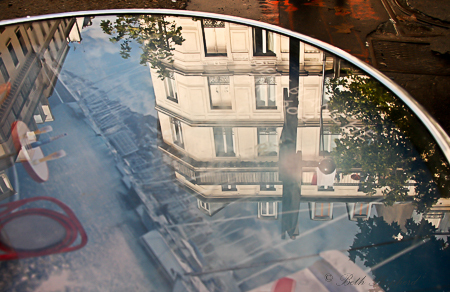 I love capturing reflections when I travel, in windows, at the water’s edge, on a tabletop, the rear window of a car. Life in the mirror, the view before your eyes. And yet, at the same time, a different perspective. 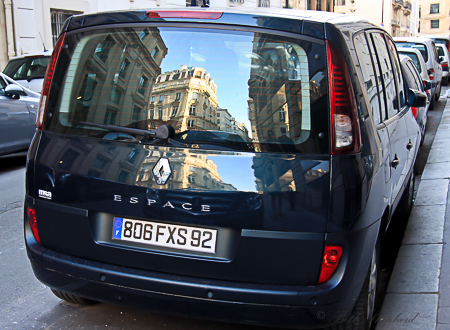 Here are a few, from Paris. As a photographer, with a daughter who does not like being in front of the camera, I am forever trying to coach a smile. 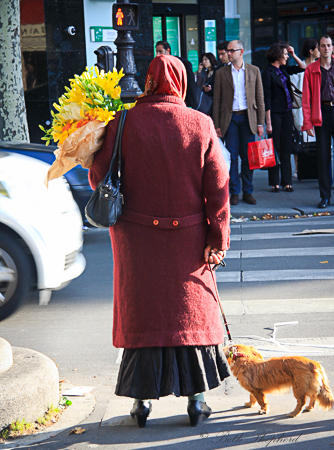 And when traveling, catching candid photos of locals–face on–can be a challenge or, in some countries, dangerous. 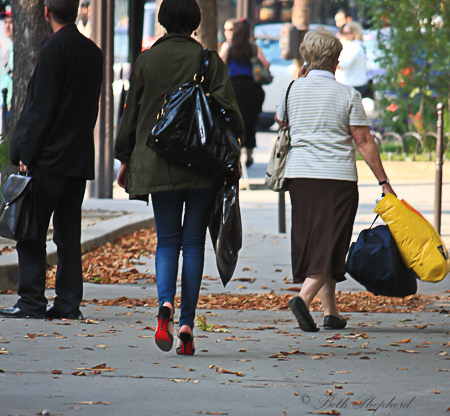 Interestingly enough, I’ve found you can still capture the mood of a person from behind. You also get a sense of them from their stance, gestures, action, clothing, and the intimacy or distance with which they are standing next to their family or companions. 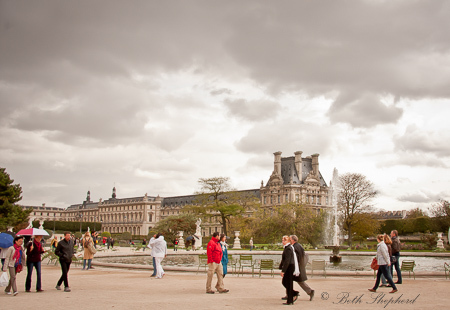 Here are a few shots I’ve taken “behind the scene” in Paris. 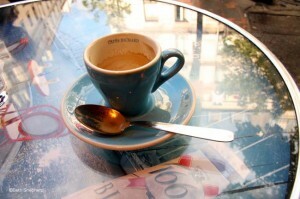 There’s nothing like a cup of fresh espresso, particularly if one is fortunate enough to drink it in the city of light. 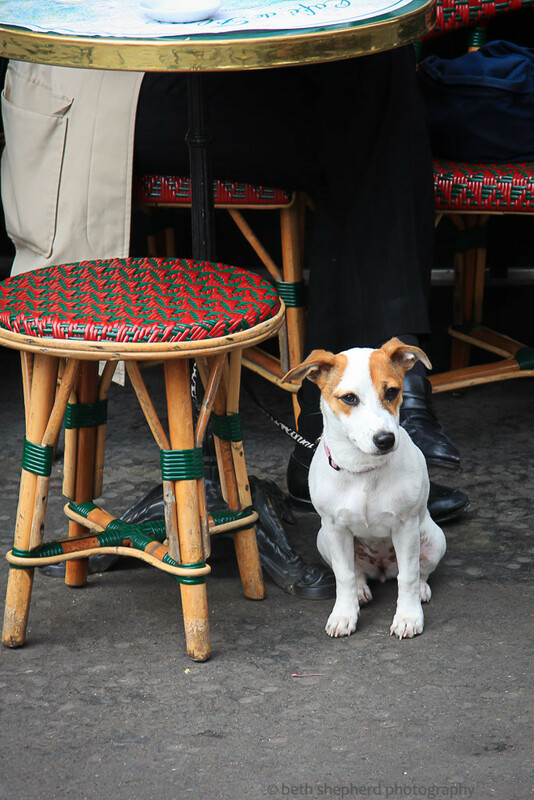 Sitting at a sidewalk café and sipping from our demitasse, Big Papa and I watched the world go by, Parisian style. Across the street at a butcher’s shop, two little girls stood outside waiting for their mother. Dressed in pink and red they coordinated with the colors of the shop to a ‘t.’ Small dogs sat on the laps of doting owners. Cigarettes hung between fingertips of passersby. The white noise buzz of cars and conversation played in the background. This scene was repeated over and over on street after street. Cafés spilled out along avenues as large as rivers and sandwiched themselves into corners on the tiniest of crooked side streets. Friends, lovers, parents, and students nestled two by two at petite tables, hands holding warm porcelain cups, musing about life. In Seattle we have many fine restaurants. There are outdoor farmers markets and high end organic grocery stores. But we do not have a café culture like they have in Europe. Starbucks may say they try to create the “third place” and indie cafes might attempt to emulate international coffee culture by placing a few tables outside, but it’s just not the same. 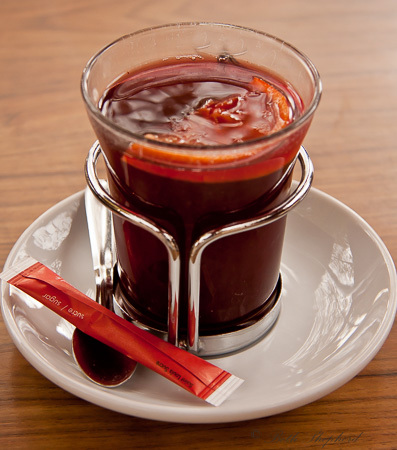 Maybe it’s the weather (this year’s non-stop rain isn’t exactly conducive to sipping street-side or maybe (more likely) it’s our social culture – the rush, rush, I need my coffee and I need it now. To go. Or folks sit silently staring at their laptops or texting away madly on their iPhone. During our recent jaunt to Paris, I also noticed that café goers with an open laptop beside their cuppa java were far and few between. Sure there were iPhones and Paris is hardly anti-technology, but most of the people we saw not only managed to make it through a cup of coffee or two and actually interact with their companions, they even seemed to enjoy it. I found it refreshing. 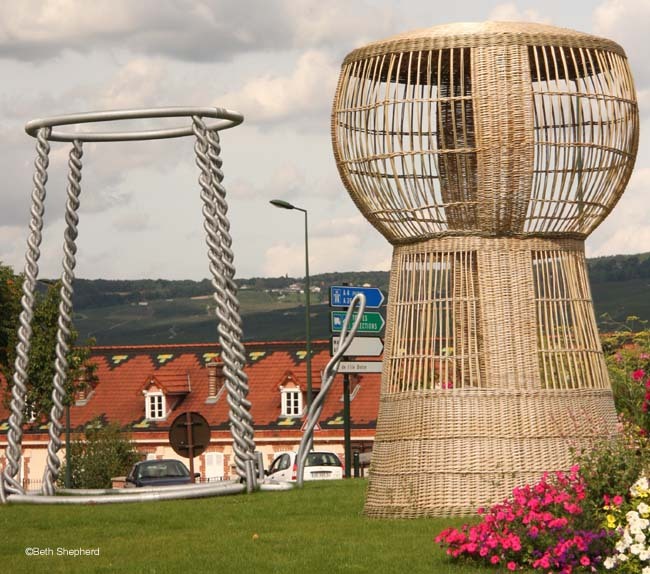 Taking the time to disconnect electronically and reconnect with one another seems to be rapidly disappearing art in the ‘ole U.S. of A. And while there were many things I was grateful to come back stateside to, a slow cup of espresso and a good long chat shared with someone you care about, was a perk of Europe I was sad to leave behind. Want to sip on some more? Check out Wanderfood Wednesday! Outside our train window, vine covered slopes stretched out as far as we could see, knitting together small villages with red tiled roofs and wooden shutters. 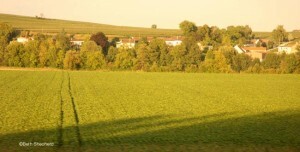 The river Marne gracefully cut a green swath along the edges of this landscape. A more peaceful scene I could hardly imagine which belied the history of fierce World War I battles that took place along the Marne’s banks. 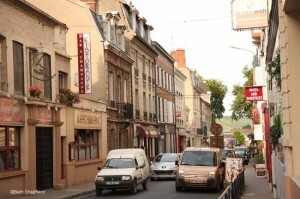 Big Papa and I were heading to Epernay, a small town of 25,000 residents in the heart of the Champagne region of France. Founded back in the 5th century by tanners, Epernay was passed into the hands of the Counts of Champagne in 1024. The town is roughly 88 miles from Paris; our train ride took 45 minutes with a few stops at smaller villages along the way. 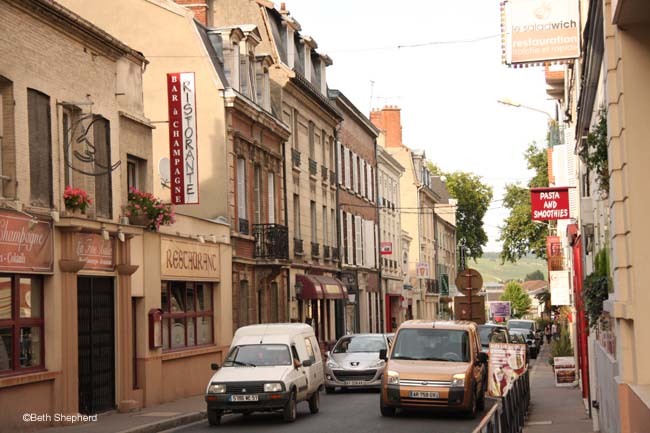 Once there, we moseyed up the appropriately named ‘Avenue de Champagne,’ passing by many of France’s famous champagne “houses”: Moet and Chandon, Castellane, Mercier, and Perrier-Jouet. 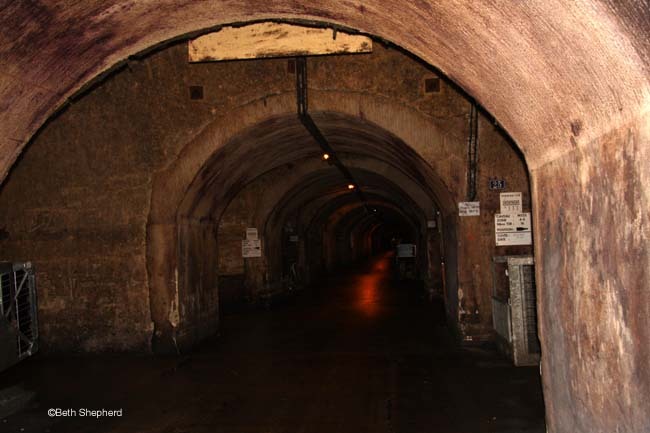 It was fascinating to imagine that underneath our feet more than 100 kilometers (or over 328,000 feet) of tunnels dug into chalk soil were sheltering millions of bottles of aging champagne. Ah, champagne. I confess I rather like the bubbly and so a chance to tour and taste champagne in Champagne was a pretty big thrill. It is, after all, the wine of celebration. No other wine has quite the same reputation for launching ships or toasting weddings. Its meaning is universal. Although Dom Pérignon has been credited as the inventor of champagne, in reality he was only a contributor to the process now associated with bubbly wine. 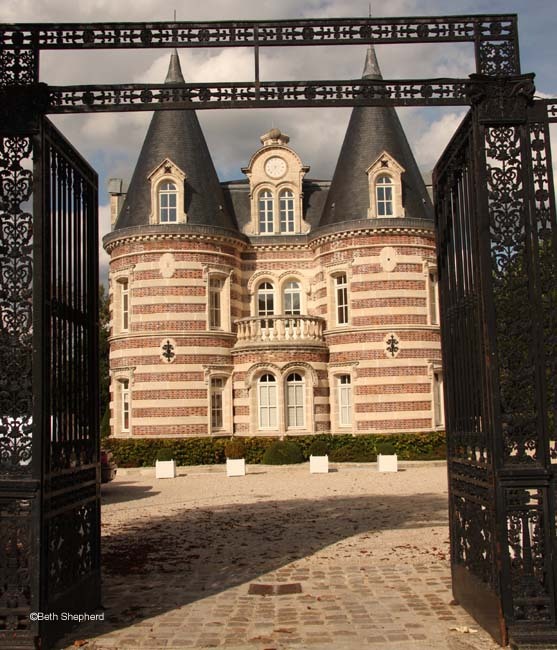 Pérignon was a Benedictine monk who, in 1688, was appointed treasurer at the Abby of Hautvillers, near Epernay. 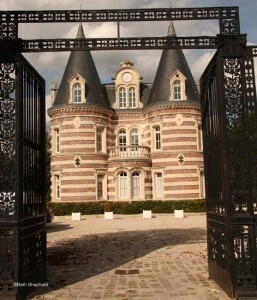 Included in Dom Pérignon’s duties was the management of the cellars and wine making. 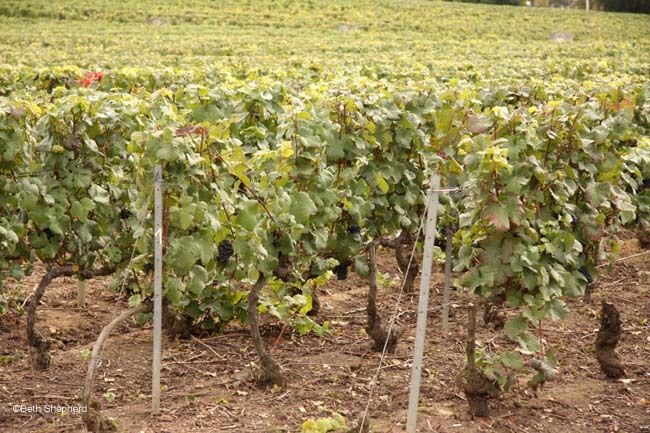 The bubbles in the wine are a natural process arising from Champagne’s cold climate and short growing season. Of necessity, the grapes are picked late in the year. This doesn’t leave enough time for the yeasts present on the grape skins to convert the sugar in the pressed grape juice into alcohol before the cold winter temperatures put a temporary stop to the fermentation process. With the coming of Spring’s warmer temperatures, the fermentation is again underway, but this time in the bottle. The re-fermentation creates carbon-dioxide which now becomes trapped in the bottle, thereby creating the sparkle. 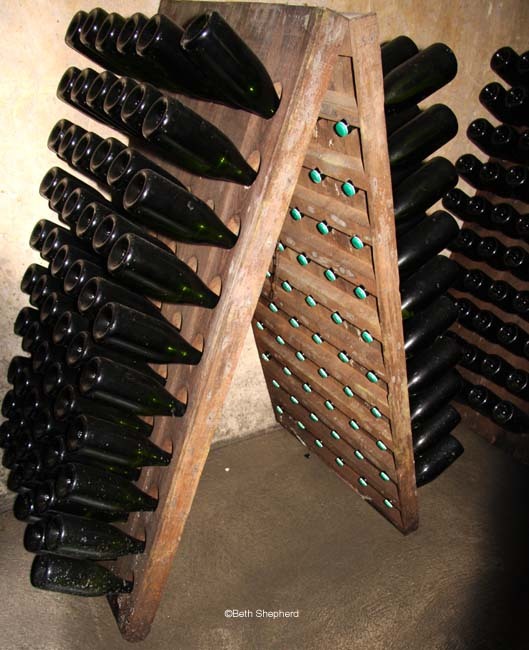 For Dom Pérignon and his contemporaries, sparkling wine was not the desired end product. It was a sign of poor wine making. He spent a great deal of time trying to prevent the bubbles, the unstableness of this “mad wine.” Although he was not able to prevent the bubbles, he did develop the art of blending grape varietals. 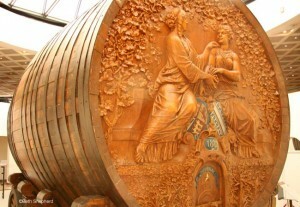 He also found a method to press the black grapes and yield a white juice, improved clarification techniques to produce a brighter wine than any that had been produced before. 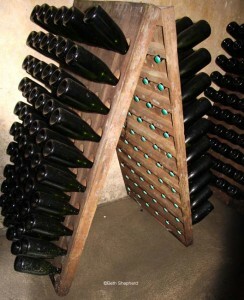 To help prevent the exploding bottle problem, he began to use the stronger bottles developed by the English and closing them with Spanish cork instead of the wood and oil-soaked hemp stoppers then in use. Dom Pérignon died in 1715, but in his 47 years as the cellar master at the Abby of Hautvillers, he laid down the basic principles still used in making champagne today. 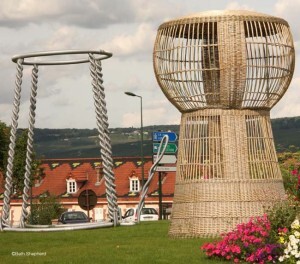 Sparkling champagne was only about 10% of the region’s output in the 18th century. But over the years, it became increasingly popular as the wine of aristocrats and royalty. Its influence in the world of wine continued to grow until, in the 1800’s, the sparkling wine industry was well established. 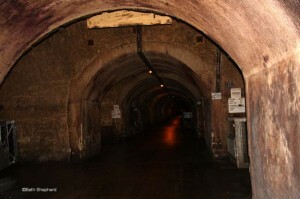 Big Papa and I chose the ‘Mercier‘ house of champagne and signed ourselves up for their tour which involves riding a laser-guided automatic train through caves 100 feet underground. Mercier was founded in 1858 by a young entrepreneur by the name of Eugene Mercier. 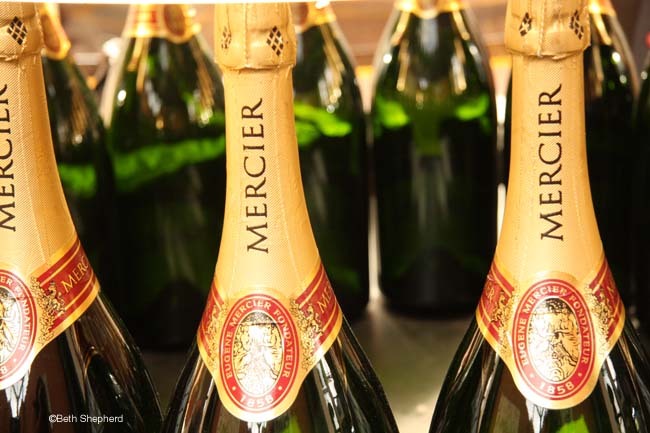 He was 20-years-old when he started the Mercier champagne house. Mercier was a forward thinker and believed in the power of advertising. 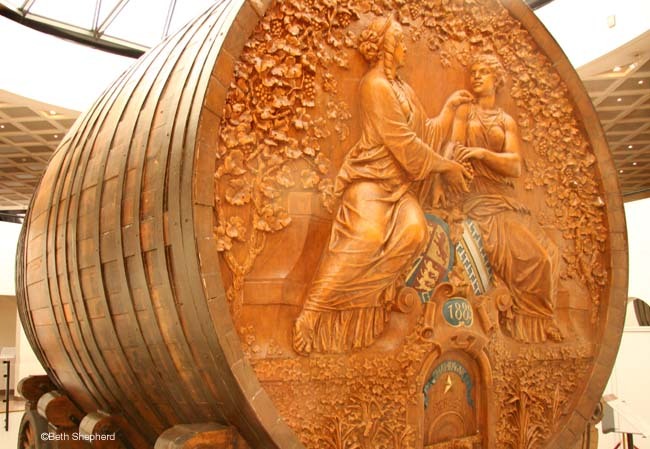 To further his reputation as a world-class champagne maker, he built the world’s largest wine vat for the 1889 World Exhibition; it took 150 oak trees to construct the vat which held the equivalent of 200,000 bottles of champagne. After our Mercier tour we continued up the road to see the castle once owned by the Mercier family. Yes, the castle. I have to admit, it was all a bit surreal. On our way back, we stopped at Castellane and managed to nab two spots on the final tour of the day where we learned a bit more about how champagne is bottled, packed and shipped. Of course one of the highlights from our day was the several glasses of champagne Big Papa and I enjoyed. As with all true champagnes, our glasses held a blend of three grapes – Pinot Noir, Chardonnay, and Pinot Meunier. Smooth fine bubbles, a bit of fruit aroma and a touch of toast and apple on the palate. Delicious! 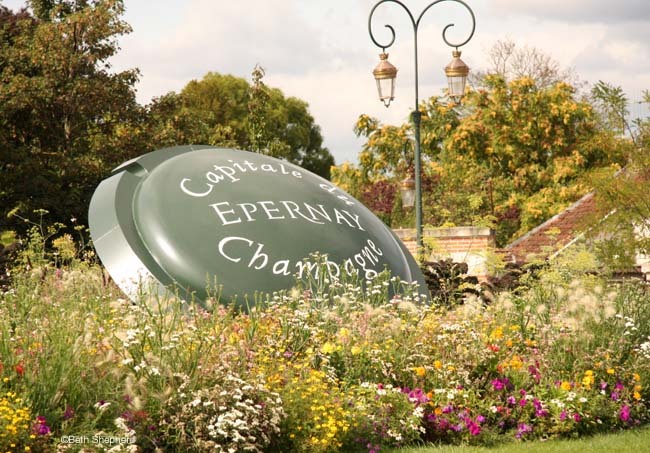 I must say I was a bit sad to leave lovely Epernay and would have liked to continue tasting our way through the rest of town. But we did buy a small bottle of bubbly to bring home, and have an occasion in mind for when we’ll pop the cork! Want more fizz in your day? Check out Wanderfood Wednesday! 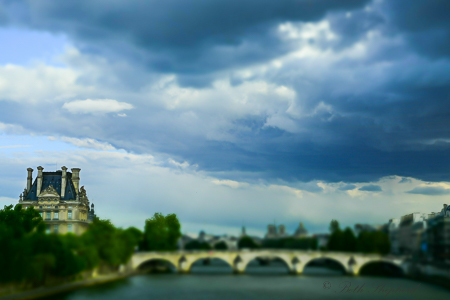 Paris is the city of light. It is also the city of bread. 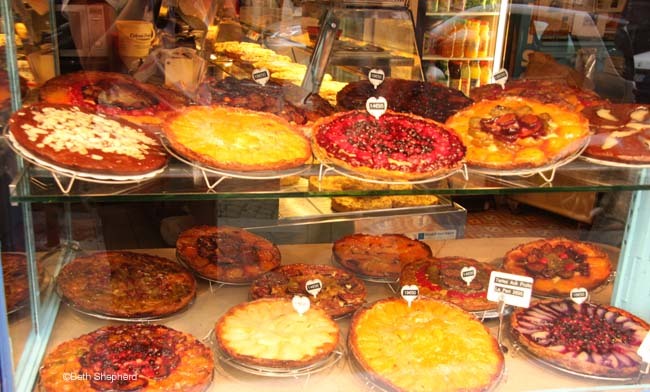 You can’t throw a cell phone without hitting a bakery or pastry shop. Baguettes are tucked under arms wherever you go. 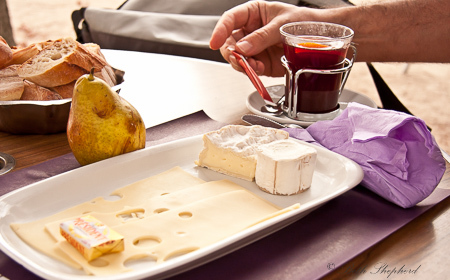 In fact a baguette and an espresso is the breakfast, de rigueur, for most Parisians. Croissants, Tarts, Macarons, Palmiers, Langues de Chat (“cat’s tongues”), Madeleines, Brioche, Beignets…the list is endless. Traveling in a city where wheat abounds is well and good unless you must dine gluten-free. Or, as in the case of Big Papa, have a rare and potentially life-threatening allergy to wheat combined with exercise, otherwise known as exercised-induced anaphylaxis. One Saturday afternoon, when I was first dating Big Papa, he was out mowing the lawn when I arrived at the Urban Cabin. Unbeknownst to me, he had also just polished off a burrito for lunch. A few minutes later, he announced he might be having an allergic reaction. Barely fifteen minutes passed and we were on our way to the emergency room, his lips so swollen that he looked like he’d had collagen injections gone bad. His tongue was swelling and his entire body was covered in hives. We lovingly refer to that incident as the “Monkey Face” episode. Then there was the time when he had a pizza at work before walking home. I got a call from a nice paramedic who told me he was O.K. but in the E.R. once again. This time, his blood pressure dropped so fast that he passed out on the street corner mere blocks from our house. When he would come to, he’d sit up and then keel over again. I’m sure passersby figured he’d had one too many to drink. He was completely pink from head to toe and the medics asked him if he’d “been at a tanning booth recently.” For anyone who knows Big Papa, this is pretty funny. We lovingly refer to that incident as the “Human Shrimp” episode. Ironically, if exercise is not involved, Big Papa is a very pro-wheat sort of guy. He is able to eat pasta for dinner most every night with impunity as long as he doesn’t feel the urge to do a set of jumping jacks. It took several years and half-dozen trips to the emergency room to put two and two together as most of the offending meals consumed before each trip where foods he’d eaten problem-free on more than one occasion. It should also be mentioned that aspirin is an additional complicating factor as it apparently speeds up wheat absorption. We found out about this very recently when Big Papa had a headache, took two aspirin and followed that up with a lovely meal of chestnut pasta with mushroom cream sauce (made by yours truly). He then proceeded to wash the dishes. Twenty minutes later, my dear husband was lying on our couch hooked up to an EKG machine and IVs while being attended to by the paramedics. The things guys will do to get out of dish duty! Needless to say, after we finally figured out the culprits, Big Papa became very careful about ingesting anything with wheat in it if he planned on getting his heart rate (and body temperature) up even the slightest. This allergy is manageable when you’re on home turf and can choose from a wide range of food sources. On the road, it’s another story altogether. This brings us back to Paris. 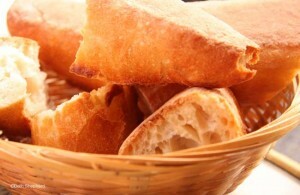 Most cafes serve baguettes or croissants for breakfast. Finding a cafe that offered eggs or omelets proved to be something of a challenge. We asked at several places if they offered eggs ala carte or even at all. “Mais non” was a common response. 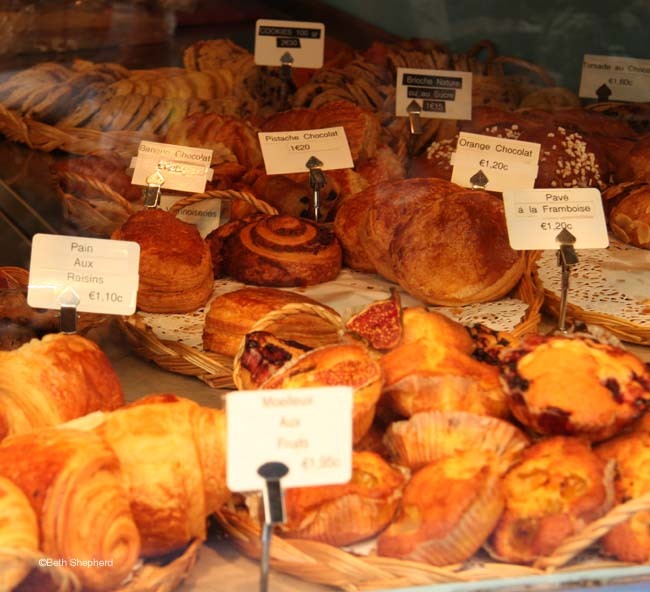 All in all, leaving the pastries on the other side of the patisserie window is probably a good thing for both of us. Big Papa stays out of foreign hospitals and I stay at the same size jeans. That said, as we passed by window after window filled with flakey, buttery, wheat-laden treats, I confess I felt a little wistful. C’est la vie. Want more to chew on? Check out Wanderfood Wednesday! 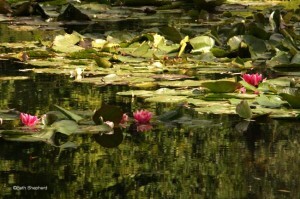 I still remember the first time I saw Monet’s water lily paintings in Paris. Standing in the middle of the circular room at the Musee de l’Orangerie, the walls awash in color, I felt transported to the gardens of Giverny where Claude Monet lived and painted for 43 years. Monet once said, “I perhaps owe it to the flowers for becoming a painter.” As a gardener and an artist myself, this sentiment rings true. For many years, until Polaroid discontinued the film, I was an avid SX-70 photographer. 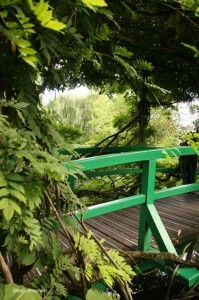 I dreamed about visiting and photographing Giverny after seeing Elizabeth Murray’s painterly photographs. Ever since I caught my first glimpse of Monet’s ‘Nympheas’, some thirty years ago, I’ve wanted to visit Giverny and be able to see the garden that inspired Monet’s passion. And finally, at long last, I did. During our recent trip to Paris, Big Papa and I took the 45-minute train ride west to the lovely town of Vernon. From Vernon, we traveled by bus to Giverny, a tiny village a few miles away. 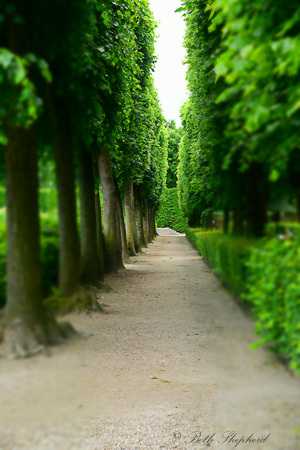 I wish, as I’m sure many people do who visit the gardens, that we could have had even ten minutes there alone, in peace. 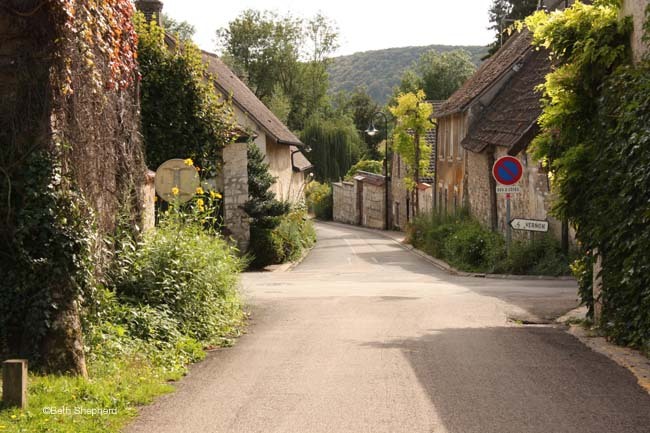 Even in September, throngs of tourists filled the little streets that ran between the museum in Giverny and Monet’s house and gardens. At times, it was a bit much, dodging a group on Monet’s famous curved bridge and jostling with the hordes packed into his electrically-hued home. No matter the crowds, the gardens are as spectacularly beautiful as I imagined they would be. 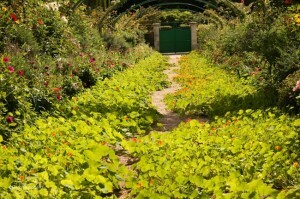 A river of Nasturtiums flowed beneath a metal canopy. 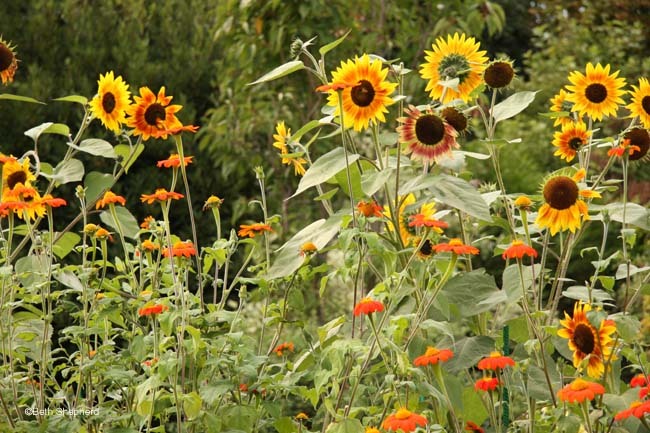 Rows of burgundy Dahlias rivaled brilliant golden Sunflowers while hundreds of lucky birds flew from flower to flower singing loudly about their good fortune and enormous bumblebees made themselves dizzy with pollen. We wandered between Monet’s water gardens and flower beds, stopping to ooh and ah at the profusion of colors and shapes that surrounded us. Trees reflected in the ponds and it was hard to tell which was direction was up and which was down. Our sense of smell and sight were on red alert from all the stimulation. Inside Monet’s house a riot of color awaited us. 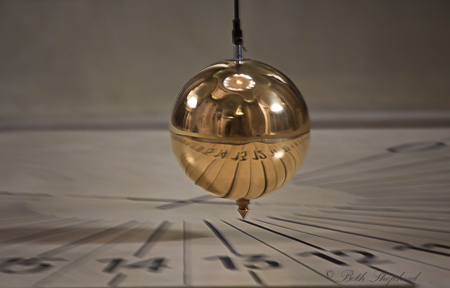 An entry room painted floor to ceiling in sky blue, even including the grandfather clock. The kitchen was an acid yellow. I felt like had been dropped into a scene from Alice in Wonderland. One surprise during our visit was Monet’s obsession with Japanese art. I hadn’t known how greatly Asian art influenced his work. Intricate paintings he’d collected adorned the walls, some 231 prints in all. Japanese bamboo furniture and porcelain dinnerware were also tucked into corners throughout the house. 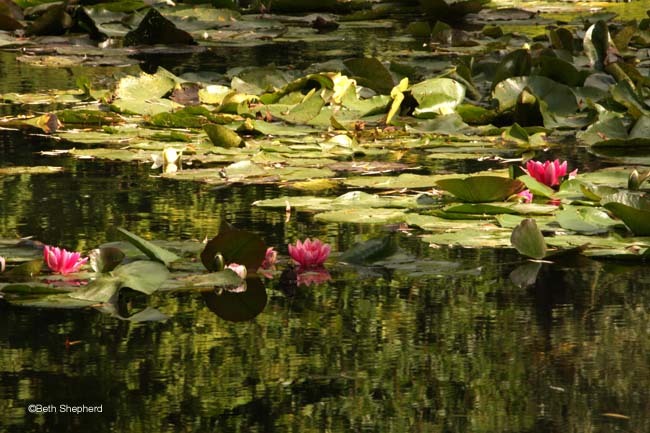 I had mused aloud as we walked through his water gardens that I felt like I was in a park in Beijing…now I know that Monet did indeed draw inspiration from far eastern art and design. The curve to the wooden bridge, a bamboo garden, water lilies, and the way the weeping willows draped themselves over the water’s edge. All were reminiscent of the scenes in the Japanese paintings hung carefully around his home. What moved me the most during our time at Giverny was the connection between this man, his garden and his art. 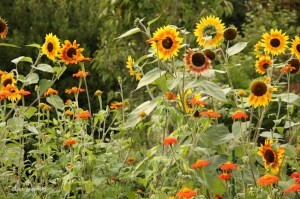 Gardening is an art form and a way to be close to nature. 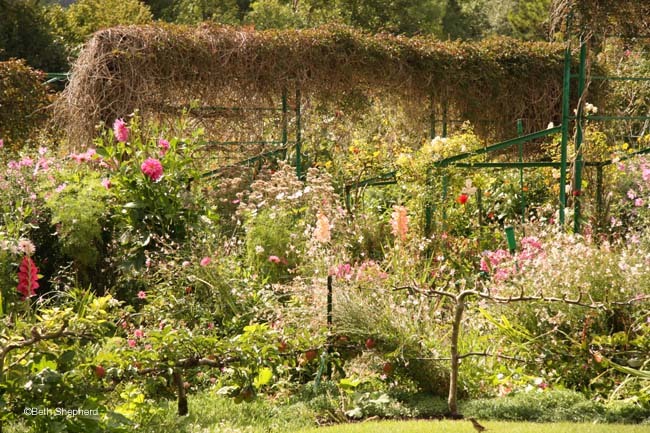 Monet watched his garden moment by moment and season by season. He captured the nuances of light and color. Monet and Giverny spoke to me for many years. And seeing it now in living, blooming color, it spoke to me still.